A private, non-profit corporation, the MHSAA receives no tax dollars from the state of Michigan or the federal government. Its membership, made up of public, private and parochial schools, pay no membership dues or tournament entry fees — the only one of two such associations nationally to not accept membership dues or tournament entry fees from schools. The opportunities for athletic participation for Michigan secondary schools has grown from the original program of football, basketball, track and baseball for boys to a total of 28 sport activities in which tournaments for boys and girls are organized and conducted by the MHSAA. If one considers the breakdown of the 28 sports into categories of male, female, classes and divisions by enrollment, and Upper and Lower Peninsula, there is a total of 120 separate tournaments in which schools vie for a championship trophy. Nearly 300,000 young men and women take part in these activities each year. 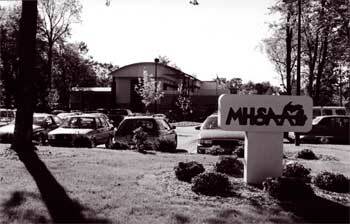 In 1976, the MHSAA moved its offices from downtown Lansing to a building on Trowbridge Road in East Lansing. The facility served as the Association's home for more than 20 years, but because of spatial needs, a new home was sought again. Ground was broken in June of 1996 on the current 18,000-square-foot building off U.S. 127 and Lake Lansing Road. The building is 6,000 square feet larger than the facility on Trowbridge Road, with 2,000 square feet designated for future expansion. The facility was opened for business in December of 1996. The building offers flexible meeting facilities as well as expanded areas for publication and audio-visual aids.